Summer is typically travel season. Whether you’re flying to a far-off destination or just taking a quick road trip to a great camping ground one or two states over, it’s perfectly understandable to want to bring mom and/or dad. But what if the loved one you want to bring has dementia? How do you navigate all the hazards of travel with the added burden of someone who may have a tendency to become anxious in unfamiliar settings – or worse, get lost? The first step is to determine whether it’s a good idea to travel with a loved one who has a degenerative disease. They may still enjoy traveling in the early stages of the disease, but as it progresses, they’ll need a higher level of supervision and will be more likely to become confused and anxious in new situations. 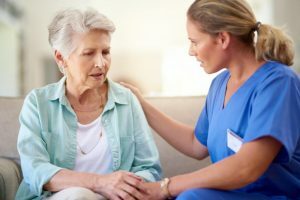 So the first thing to determine is the level of care your loved one needs and whether they can handle the stress of travel. One thing that can help in determining whether they’re fit to travel is deciding where to go. 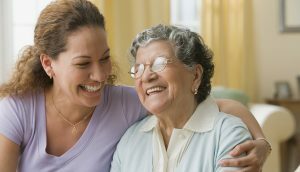 Generally speaking, travelling to far-off destinations with a different language and different customs can be a lot of fun when you’re young, but to those suffering from dementia, it can be confusing and anxiety inducing. If you do decide to take your loved ones on vacation this summer, make sure it’s to a destination that was familiar to them before they got sick. The #1 tip for any successful trip is to plan ahead and prepare for all possibilities. Not only should you make sure you and your loved one are equipped with the proper clothing for all kinds of weather, but you should also plan on bringing plenty of water, their favorite snacks, and all the medications they’ll need for the duration of the trip. In addition to your travel itinerary, make sure to keep a schedule of when they need to take each medication and have the proper medication on hand at the proper time. This will mean planning ahead to take it with you if you intend to do some sightseeing or go for a hike. In addition to packing all the necessary medications, you should keep an updated list of emergency contacts and copies of important documents. If you will be staying in a hotel, alert the staff to your needs before you arrive so they can be prepared to help you out during your stay. 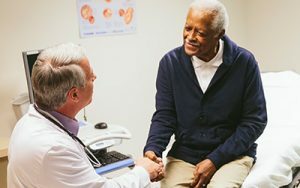 Keep in mind that new locations can trigger wandering in patients with dementia as they seek out the familiar, so stay alert and take advantage of programs like the MedicAlert® + Alzheimer’s Association Safe Return®. Finally, make sure to travel during the time of day when your loved one is at their best. 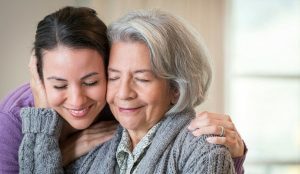 People with dementia often experience increased anxiety during certain periods of the day, usually around sunset, hence the term “Sundown Syndrome.” Know when your loved one is at their best and when they tend to be at their worst and plan accordingly. During the times of the day that tend to be tough for them, be sure to have something familiar and comforting on hand that you know will help reduce their anxiety. Dementia can be scary and confusing for everyone involved. Those with dementia often feel lost, confused, and out of control of their own lives – all of which are terrifying. That fear can sometimes prompt them to lash out violently (either verbally and/or physically) against those around them, which is both painful and frustrating for the targets of their aggression. So what should you do in such a situation? How can you calm them down and avoid hurting them? The first step is to educate yourself. Know the signs of dementia and some of the behaviors that might come along with it. 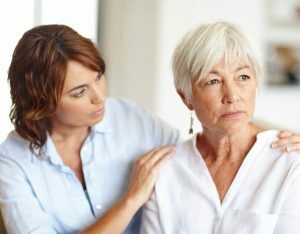 This can often start with the patient insisting they want something they can’t have (such as to go “home”) or that they don’t want something they can’t avoid (such as something in the environment, something in their schedule, or even the caregiver themselves). A simple statement can sometimes turn to yelling and may escalate into violence. As tempting as it can be to argue with them, that’s not helpful. Don’t try to force the issue and don’t restrain them if it’s not absolutely necessary. Instead, try to divert their attention to something else while speaking to them in a calm, measured voice. Statements like “I want to go home” are often the most painful to hear out of someone with dementia who is already home. It means they’ve forgotten where they live, and they want to return to a place where they lived during another part of their lives. The most important thing to remember is not to argue with someone with Alzheimer’s or dementia because that is an argument you will never win. You cannot reason with someone who is suffering from dementia and trying to do so often only makes things worse. Depending on the person, explaining the change in their situation, especially through the use of photos and tangible objects, might work, but more often than not it’s best to try to distract them. Suggest going for a walk with them or getting a snack and get them to talk about other things. If they ask things like “When are we leaving?” or “When are we going home?” try putting them off by telling them you can’t leave until traffic clears up or the whether is better. Sometimes a small lie is better than trying to explain to them what they can’t (or don’t want to) understand. This can take a variety of forms – from trouble with finances, to hoarding, to paranoid behaviors, such as accusing a loved one of stealing from them. While some of these strange behaviors are obvious, others take more subtle forms, making them difficult to diagnose. 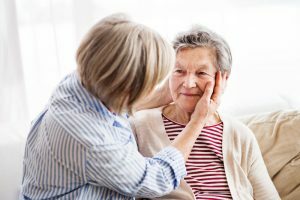 The person with dementia may not even know they’re struggling with something, and even if they do, people are rarely willing to admit they need help. If you suspect a loved one may be suffering from poor judgment, try to find out quietly. See if you can get a look at one of their bills to make sure they haven’t missed any payments. If that’s not possible, try to have them figure out the tip at a restaurant and see if they struggle any more than they usually do. The most important thing is to remain encouraging and reassuring. Offer to help in small ways that minimize the other person’s embarrassment. Again, don’t ever try to argue with them, and don’t ask them outright if they’re unable to handle certain situations because that won’t end well.